CARBONDALE, Ill. — SIU Carbondale alumnus Ken Brown, an entrepreneur, motivational speaker and success coach, proudly subscribes to Winston Churchill’s motto: “We make a living by what we got, but we make a life by what we give.” The 1988 food and nutrition graduate’s actions support his beliefs in a big way. Brown, a Chicago native, is donating $100,000 to fund scholarships for minority students in various majors at Southern. His gift was made in cooperation with the University’s Hope and Opportunity initiative, which seeks to raise $1 million to provide equal opportunities and financial assistance to minority students and other traditionally underrepresented populations. “My parents taught me that education was the way out of poverty. I took a leap of faith by attending SIU,” he says. “I’ve been afforded tremendous opportunities. According to the word of God, of whom much is given… much is required. The University and Carbondale communities can hear Brown’s story firsthand during his visit to campus on Monday, Jan. 25, and Tuesday, Jan. 26. Brown will be speaking and visiting with various student organizations and leaders, the University’s student affairs division and campus administrators. Presentations are open to the public at 7 p.m. both days. On Monday, attendees are invited to gather at the Student Center Auditorium, while Tuesday’s presentation will be held in the lower level of Grinnell Hall on campus. Book signing sessions are scheduled to take place after each event. In addition, Brown will also speak at a Brown Bag Luncheon at noon on Tuesday, in the Kaskaskia/Missouri Rooms of the Student Center. The Division of Student Affairs is sponsoring Brown’s campus visit in conjunction with the SIU Foundation. 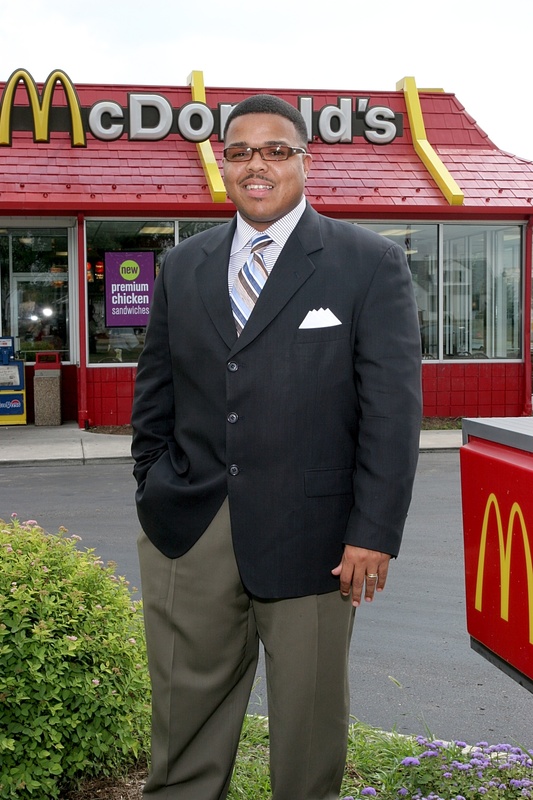 The owner and operator of two McDonald’s restaurants in the Detroit area by the age of 35, Brown says he relishes the opportunity to share his message with students at his alma mater. Larry H. Dietz, vice chancellor for student affairs, says Brown’s message should resonate with the University community. Brown, 43, was born to unmarried, teenage parents. He experienced a humble beginning to his life, including 10 home evictions. Despite financial challenges his family encountered, Brown’s parents stressed perseverance and insisted that each of their children attain a college education. He subsequently applied for Pell Grants, guaranteed loans and financial assistance. Brown entered SIUC in the fall of 1984. However, Brown had a modest C average in high school. Southern accepted him through its Center for Basic Skills (now Center for Academic Success), a special admissions program for students who display promise. He received probationary acceptance to SIUC, and had to earn at least a B average during his freshman year to be processed through general admissions. Brown wasn’t going to be denied; he accumulated a 3.15 grade point average and was accepted into full admission. Brown joined the Alpha Phi Alpha fraternity his sophomore year. Additionally, he learned various facets of the restaurant business as a student worker at Saluki Grill, a small café on campus, which spurred his interest and passion for food service and management. After graduating from Southern, he was hired as an assistant director for ARA Services, a food management company. He spent the next 12 years progressing to various roles within the industry, including general manager for Wendy’s, sales manager for Kraft Foods, and sales consultant for The Assmussen Waxler Group and McDonald’s Corp., prior to becoming a McDonald’s owner. Brown and his wife of 18 years, Deidre, live in West Bloomfield, Mich., with their three children – Austin, 14, Bradley, 11, and Drake, 8.